View a timeline of milestones in the history of the Capitol Building on the Architect's Virtual Capitol. Thornton's plan depicted a building composed of three sections. The central section, which was topped by a low dome, was to be flanked on the north and south by two rectangular wings (one for the Senate and one for the House of Representatives). President Washington commended the plan for its "grandeur, simplicity and convenience," and on April 5, 1793, it was accepted by the commissioners; Washington gave his formal approval on July 25. Latrobe began work in 1804 by removing a squat, oval, temporary building known as "the Oven," which had been erected in 1801 as a meeting place for the House of Representatives. By 1807 construction on the south wing was sufficiently advanced that the House was able to occupy its new legislative chamber, and the wing was completed in 1811. The Capitol was by this point already an impressive structure. At ground level, its length was 351 feet 7-1/2 inches and its width was 282 feet 10-1/2 inches. Up to the year 1827--records from later years being incomplete--the project cost was $2,432,851.34. Improvements to the building continued in the years to come (running water in 1832, gas lighting in the 1840s), but by 1850 its size could no longer accommodate the increasing numbers of senators and representatives from newly admitted states. The Senate therefore voted to hold another competition, offering a prize of $500 for the best plan to extend the Capitol. Several suitable plans were submitted, some proposing an eastward extension of the building and others proposing the addition of large north and south wings. However, Congress was unable to decide between these two approaches, and the prize money was divided among five architects. Thus, the tasks of selecting a plan and appointing an architect fell to President Millard Fillmore. Fillmore's choice was Thomas U. Walter, a Philadelphia architect who had entered the competition. On July 4, 1851, in a ceremony whose principal oration was delivered by Secretary of State Daniel Webster, the President laid the cornerstone for the northeast corner of the House wing in accordance with Walter's plans. Over the next 14 years, Walter supervised the construction of the extensions, ensuring their compatibility with the architectural style of the existing building. However, because the Aquia Creek sandstone used earlier had already deteriorated noticeably, he chose to use marble for the exterior. For the veneer, Walter selected marble quarried at Lee, Massachusetts, and for the columns he used marble from Cockeysville, Maryland. Walter faced several significant challenges during the course of construction. Chief among these was the steady imposition by the government of additional tasks without additional pay. Aside from his work on the U.S. Capitol extensions and dome, Walter designed the wings of the Patent Office building, extensions to the Treasury and Post Office buildings, and the Marine barracks in Pensacola and Brooklyn. When the Library of Congress in the Capitol's west central section was gutted by a fire in 1851, Walter was commissioned to restore it. He also encountered obstacles in his work on the Capitol extensions. His location of the legislative chambers was changed in 1853 at the direction of President Franklin Pierce, based on the suggestions of the newly appointed supervising engineer, Captain Montgomery C. Meigs. In general, however, the project progressed rapidly: the House of Representatives was able to meet in its new chamber on December 16, 1857, and the Senate first met in its present chamber on January 4, 1859. The old House chamber was later designated National Statuary Hall. In 1861, most construction was suspended because of the Civil War, and the Capitol was used briefly as a military barracks, hospital and bakery. In 1862, work on the entire building was resumed. 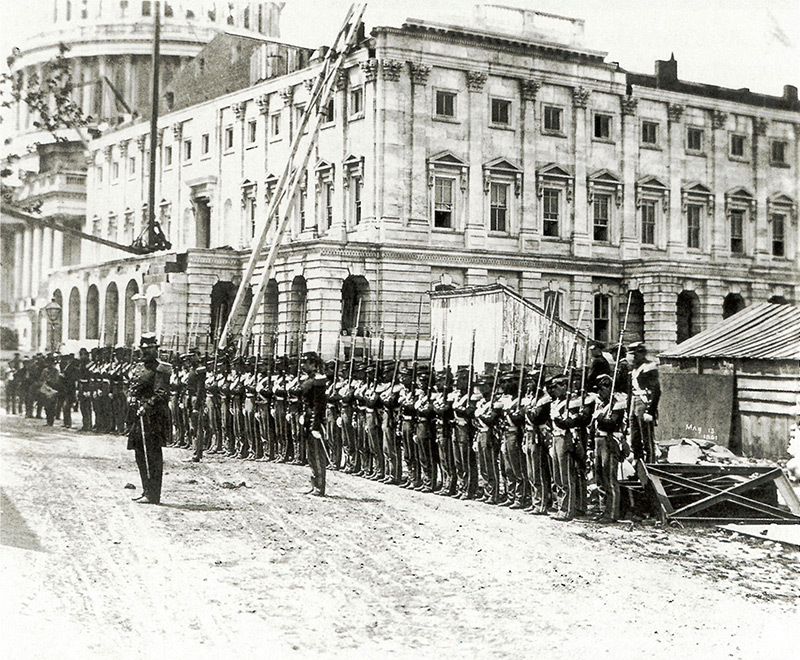 Union soldiers stand at attention in front of the Capitol, where they drilled, ate and camped at the start of the war. Workers constructed 20 ovens in the Capitol basement to bake bread for the thousands of troops in the city. As the new wings were constructed, more than doubling the length of the Capitol, it became apparent that the dome erected by Bulfinch no longer suited the building's proportions. In 1855 Congress voted for its replacement based on Walter's design for a new, fireproof cast-iron dome. The old dome was removed in 1856, and 5,000,000 pounds of new masonry was placed on the existing Rotunda walls. Iron used in the dome construction had an aggregate weight of 8,909,200 pounds and was lifted into place by steam-powered derricks. In 1859 Thomas Crawford's plaster model for the Statue of Freedom, designed for the top of the dome, arrived from the sculptor's studio in Rome. With a height of 19 feet 6 inches, the statue was almost 3 feet taller than specified, and Walter was compelled to make revisions to his design for the dome. When cast in bronze by Clark Mills at his foundry on the outskirts of Washington, it weighed 14,985 pounds. The statue was lifted into place atop the dome in 1863, its final section being installed on December 2 to the accompaniment of gun salutes from the forts around the city. The work on the dome and the extensions was completed under the direction of Edward Clark, who had served as Walter's assistant and was appointed Architect of the Capitol in 1865 after Walter's resignation. In 1866, the Italian-born artist Constantino Brumidi finished the canopy fresco, a monumental painting entitled The Apotheosis of Washington. The Capitol extensions were completed in 1868. Clark continued to hold the post of Architect of the Capitol until his death in 1902. During his tenure, the U.S. Capitol underwent considerable modernization. Steam heat was gradually installed in the Old Capitol. In 1873 the first elevator was installed, and in the 1880s electric lighting began to replace gas lights. Between 1884 and 1891, the marble terraces on the north, west and south sides of the Capitol were constructed. As part of the grounds plan devised by landscape architect Frederick Law Olmsted, these terraces not only added over 100 rooms to the Capitol Building but also provided a broader, more substantial visual base for the building. On November 6, 1898, a gas explosion and fire in the original north wing dramatically illustrated the need for fireproofing. The roofs over the Statuary Hall wing and the original north wing were reconstructed and fireproofed, the work being completed in 1902 by Clark's successor, Elliott Woods. In 1901 the space in the west central front vacated by the Library of Congress was converted to committee rooms. During the remainder of Woods's service, which ended with his death in 1923, no major structural work was required on the Capitol Building. The activities performed in the building were limited chiefly to cleaning and refurbishing the interior. David Lynn, the Architect of the Capitol from 1923 until his retirement in 1954, continued these tasks. Between July 1949 and January 1951, the corroded roofs and skylights of both wings and the connecting corridors were replaced with new roofs of concrete and steel, covered with copper. The cast-iron and glass ceilings of the House and Senate chambers were replaced with ceilings of stainless steel and plaster, with a laylight of carved glass and bronze in the middle of each. The House and Senate chambers were completely remodeled, improvements such as modern air conditioning and lighting were added, and acoustical problems were solved. During this renovation program, the House and Senate vacated their chambers on several occasions so that the work could progress. The next significant modification made to the Capitol was the East Front extension. This project was carried out under the supervision of Architect of the Capitol J. George Stewart, who served from 1954 until his death in 1970. Begun in 1958, it involved the construction of a new East Front 32 feet 6 inches east of the old front, faithfully reproducing the sandstone structure in marble. The old sandstone walls were not destroyed; rather, they were left in place to become a part of the interior wall and are now buttressed by the addition. The marble columns of the connecting corridors were also moved and reused. Other elements of this project included repairing the dome, constructing a subway terminal under the Senate steps, reconstructing those steps, cleaning both wings, birdproofing the building, providing furniture and furnishings for the 90 new rooms created by the extension, and improving the lighting throughout the building. The project was completed in 1962. Following the 1971 appointment of George M. White, FAIA, as Architect of the Capitol, the building was both modernized and restored. Electronic voting equipment was installed in the House chamber in 1973; facilities were added to allow television coverage of the House and Senate debates in 1979 and 1986, respectively; and improved climate control, electronic surveillance systems, and new computer and communications facilities have been added to bring the Capitol up to date. The Old Senate Chamber, National Statuary Hall, and the Old Supreme Court Chamber, on the other hand, were restored to their mid-19th-century appearance for the nation's 1976 Bicentennial celebration. In 1983, work began on the strengthening, renovation and preservation of the West Front of the U.S. Capitol. Structural problems had developed over the years because of defects in the original foundations, deterioration of the sandstone facing material, alterations to the basic building fabric (a fourth-floor addition and channeling of the walls to install interior utilities), and damage from the fires of 1814 and 1851 and the 1898 gas explosion. To strengthen the structure, over 1,000 stainless steel tie rods were set into the building's masonry. More than 30 layers of paint were removed, and damaged stonework was repaired or replicated. Ultimately, 40 percent of the sandstone blocks were replaced with limestone. The walls were treated with a special consolidant and then painted to match the marble wings. The entire project was completed in 1987, well ahead of schedule and under budget. A related project, completed in January 1993, effected the repair of the Olmsted terraces, which had been subject to damage from settling, and converted the terrace courtyards into several thousand square feet of meeting space. As the U.S. Capitol Building entered its third century, restoration and modernization work continued under the guidance of Alan M. Hantman, FAIA, who was appointed Architect of the Capitol in 1997 following George M. White's 1995 retirement, and Stephen T Ayers, FAIA, LEED AP, who was appointed Architect of the Capitol in 2010 after serving as Acting Architect of the Capitol since Mr. Hantman's retirement in 2007. Major projects included conservation of the Rotunda canopy and frieze and the Statue of Freedom, creation of murals in three first-floor House corridors, and replacement of worn Minton tiles in the Senate corridors. Permanent television broadcasting facilities were installed in the Senate Chamber, and the subway system linking the U.S. Capitol with the Dirksen and Hart Senate Office Buildings was replaced with a new system. Repair and restoration of the House monumental stairs was completed in 1996. A program of barrier removal begun in the 1970s continues in compliance with the Americans with Disabilities Act. Opened in 2008, the U.S. Capitol Visitor Center is the newest addition to the historic Capitol Building. At nearly 580,000 square feet, the Visitor Center is the largest project in the Capitol's more than two-century history and is approximately three-quarters the size of the Capitol itself. The entire facility is located underground on the east side of the Capitol so as not to detract from the appearance of the Capitol Building and Grounds designed by Frederick Law Olmsted in 1874. The Capitol Visitor Center contains exhibits, orientation displays, theaters and other facilities to make the visitor's experience in the Capitol more informative and meaningful.